One of our goals for the coming year here at the Arachis Press is to release revised editions of many of our titles. Not surprisingly, we have found mistakes – mostly typographical – in some of the books and intend to remedy those. Indeed, the only two completely error-free books (as far as we can tell) are the picture book, A MOUSE IS IN THE HOUSE, and the biography/art book, THE ART OF K. PAGE BROOKE. These will require no changes. There may or may not be a revision of the beginners’ chapter book, THE CONTRARY FAIRY. We have found only one very small typo there, which has no effect on the story, so it might not be worth changing. We might release an ebook (EPUB and, probably, MOBI/Kindle) version — we originally felt it was not a suitable format but are reconsidering that decision. At any rate, expect revisions of all the remaining titles over the course of 2015, beginning with our first poetry chapbook, PIECES OF THE MOON by Stephen Brooke. That’s ready to send to the printer right now. Once all four books of DONZALO’S DESTINY are revised, we do intend to offer a combined print version, possibly including a hard-cover edition. Expect that before the coming year ends. Of course, we do hope to offer new titles and that will receive priority over the work on the older books. What will those new titles be? Stay tuned and find out! 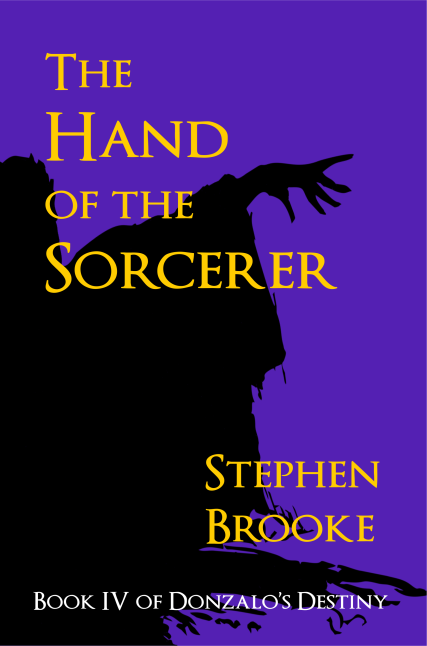 Today marks the official release of the fourth and final book of 'Donzalo's Destiny,' THE HAND OF THE SORCERER by Stephen Brooke. This novel brings the fantasy saga to a conclusion. Purchase at Arachis Press or our Lulu store. By the way, be sure to check our deals page for the latest discounts! More news upcoming, as we finalize design and printing, prepare a video book trailer, and all the other chores that go into the release of a book. 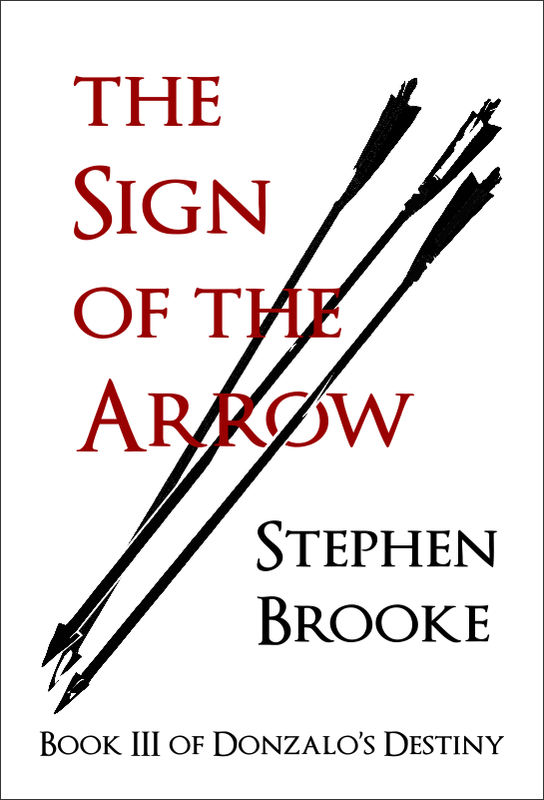 We have created a simple video to go with Stephen Brooke's third Donzalo novel, THE SIGN OF THE ARROW. We have set the official release date for THE SIGN OF THE ARROW for the First of August. It might show up in our store before then, but this is the official date. We have our proof print copy of the finalized book on its way and will soon have the ebook versions ready. Working on a video trailer, too --- watch for it! 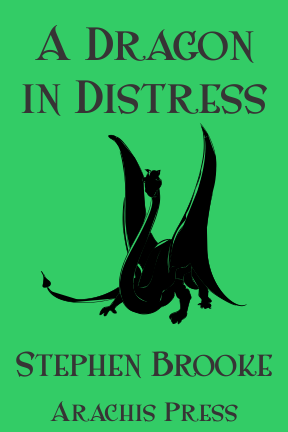 We have made an EPUB copy of Stephen Brooke's fantasy short story, A DRAGON IN DISTRESS, available as a free download at our Lulu Spotlight store. For youngsters of any age. A TALE OF TWO TURKEYS continues to be a free download as well. Stephen Brooke's latest entry in his Donzalo saga is set for release later this year. Currently in edit and design phases! We haven't much news at this point. The next novel in the Donzalo's Destiny series is months from publication, most probably appearing sometime this fall, and no other projects have official publishing dates right now. Incidentally, we also have a store with Arachis Press-related merchandise at: http://www.cafepress.com/insolentlad/8162168 Right now, 'A Mouse Is In the House' tees and other products are available. We hope to add some Donzalo merchandise soon. As you may note, we have added a dedicated 'Specials' page to this blog/site, mostly to publicize the current deals at our printer, Lulu. Check it regularly for discounts --- we will keep it updated. We may eventually have some direct deals, as well. The intention is to add MOBI ebook files (for you Kindle users) to our offerings and would not be selling these through Lulu. More on that when we figure out the logistics! In the meantime, we do have MOBIs of the first two Donzalo novels ready so if you must have them immediately, write us and we'll see about getting them to you. There is a possibility we may drop this Blogger announcement blog for one we host directly on our own site (probably in WordPress format). We will be seeing about that and let y'all know when and if it happens. ADDENDUM, March 23: We will be able to offer our ebooks via Amazon after all, for all you Kindle users. Both our Donzalo titles should soon be available at both Amazon and Kobo, same price as elsewhere. We may offer them as a package elsewhere, anyway. Stay tuned for news on that. And we do not intend to offer print editions through Amazon, although we have the opportunity. We would have to charge far too much and we would rather pass the savings on to you, our readers, so purchase them at our site or at Lulu. Through March 10, save 20% on titles at our Spotlight Store at Lulu. Use Code: SUPER20 for the discount. Specials are often available through Lulu --- we will try to post them here (perhaps on a dedicated page). Today, March 1, 2014, marks the official release of THE SHADOW OF ASAK, the second book in Stephen Brooke's 'Donzalo's Destiny' series. Available at the Arachis Press site: http://arachispress.com in print, EPUB and PDF (as well as at Barnes & Noble and Apple). 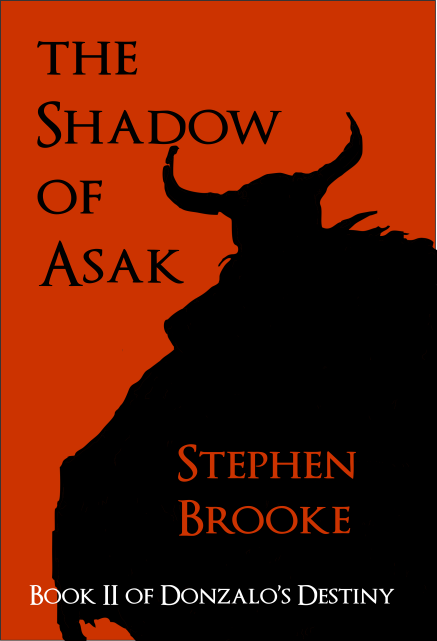 A simple book trailer we put together for the upcoming (due in March) fantasy novel from Stephen Brooke, THE SHADOW OF ASAK (the Second Book of Donzalo's Destiny). Design and music by the author. THE SHADOW OF ASAK, the latest novel by Stephen Brooke (and the second book in his fantasy epic, Donzalo's Destiny) is officially set for release on March 15. We hope to have a trailer and more info up very shortly. Young Donazalo has left his home and his familiar life in Lama, fleeing assassins and dark magic. In the rugged hills of the Cuddon he finds love. In the hidden land of the Fay he finds new purpose. And on the road home, new dangers and new allies await him, in the Second Book of Donzalo’s Destiny, The Shadow of Asak.